Day 23: it’s the final week of the Vegan Challenge, but this is recipe zero. For me, celebrating vegetables began with this one. When we were on holiday in Belgium once, we went into a small restaurant expecting not very much. The food was amazing, and happiest of all was my son’s vegan friend. There wasn’t anything vegan on the menu, but the chef produced a huge platter of vegetables for him, crowned with an artichoke. The omnivores at the table were all jealous, especially my four year old daughter. Artichokes have been her number one treat ever since. They are great fun to eat: peel off the leaves one by one, dip them in the vinaigrette and scrape off the fleshy part with your teeth. When you get to the fuzzy, inedible choke, carefully scrape it off to reveal the heart, the most delicious bit of all. 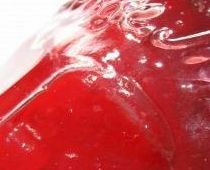 And they’re so easy to prepare – just see below. Bring a pan of water to the boil. The pan should have a lid and be big enough to fit the artichokes in one layer. 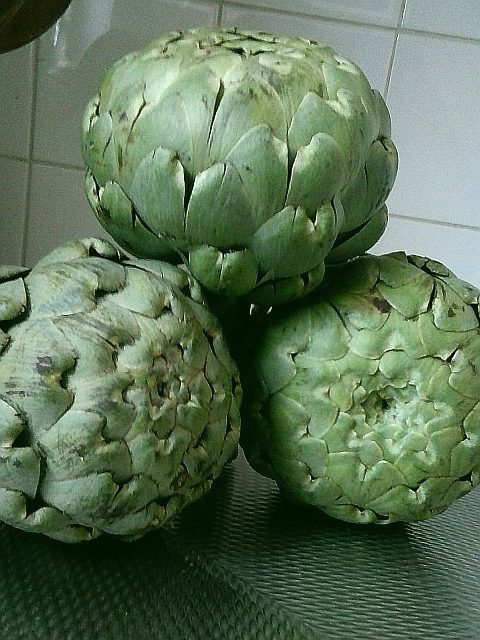 Meanwhile, rinse the artichokes well and trim off the stalk and the tops of the leaves (see photo). 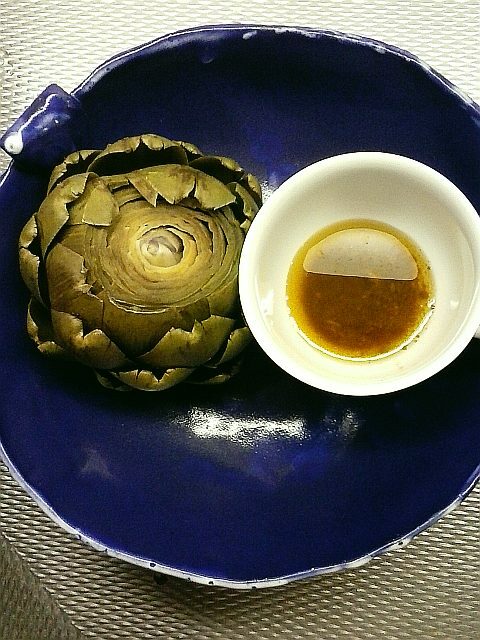 Put the teaspoon of salt and the light vinegar or lemon juice in the boiling water, then drop in the artichokes. Boil for about 40 minutes until the outer leaves come away easily if you pull at them. Meanwhile, make the dressing: mash the garlic and salt to a pulp in a pestle and mortar, add the vinegar and then the oil, and salt and pepper to taste. If you don’t have a pestle and mortar, just chop the garlic very finely and combine with the rest of the dressing ingredients. 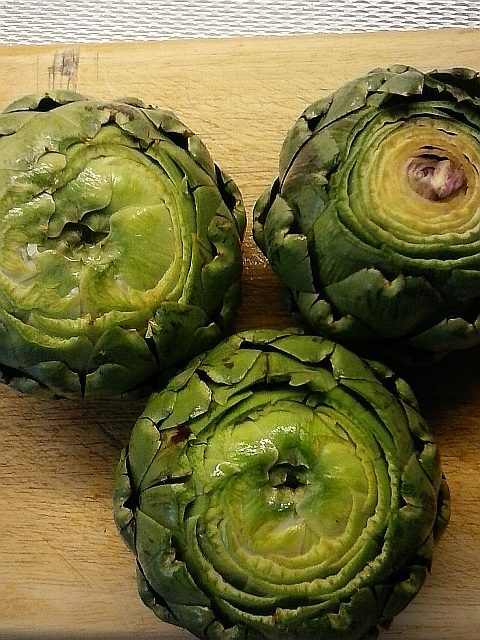 Drain the artichokes upside down in a colander and serve warm with the vinaigrette – and somewhere to put the spent leaves!